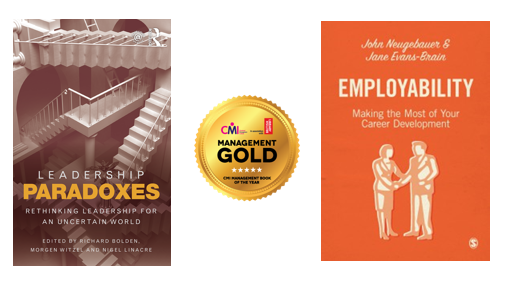 Two books by members of Bristol Leadership and Change Centre at Bristol Business School, University of the West of England, have been shortlisted for the Chartered Management Institute (CMI) Management Book of the Year award. Held in association with the British Library and sponsored by Henley Business School, this competition aims to celebrate the best of management books published or distributed in the UK, from the most inspiring to the most useful. The shortlisted books are Leadership Paradoxes: Rethinking leadership for an uncertain world, edited by Richard Bolden, Morgen Witzel and Nigel Linacre (Routledge, 2016), and Employability: Making the most of your career development, by John Neugebauer and Jane Evans-Brain (Sage, 2016). Both were been submitted to the Management and Leadership Textbook category, and are part of a shortlist of five. Category and overall winners will be announced at an awards dinner at the British Library on 6th February 2017. For further details please visit: http://yearbook.managers.org.uk and follow #ManagementGold on Twitter.